Miss Akokla is a 15 Year old student in 10th grade. She comes from a family of 3 siblings. Her father passed away when she was 14 years old. Her mother supports the family working as a farmer but is not able to meet all the financial needs of the family. 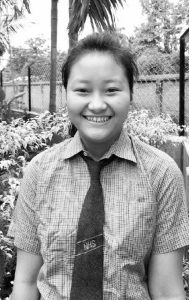 HelpLive is sponsoring Akokla study at a school in the city of Dimapur, a much better school than the local one she was attending, as she prepares to finish her high school. Her dream is one day to become a doctor.